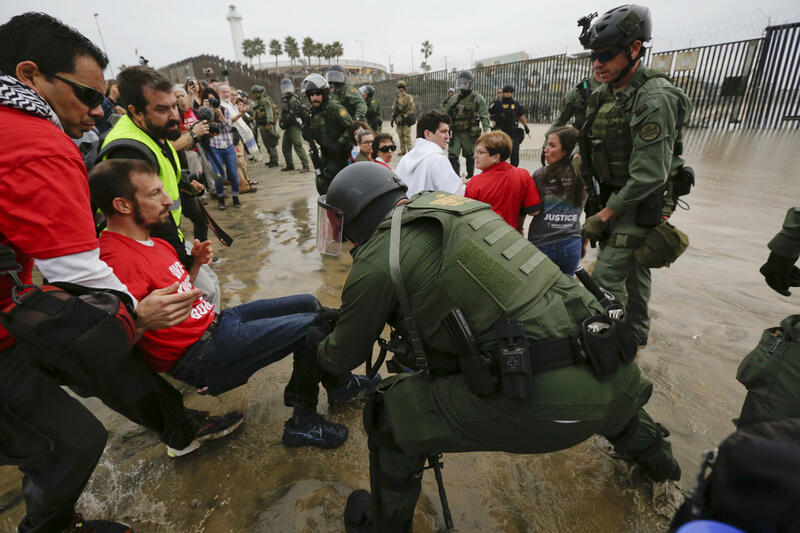 SAN DIEGO — U.S. Border Patrol agents arrested 32 people at a demonstration Monday that was organized by a Quaker group on the border with Mexico, authorities said. The protesters were calling for an end to detaining and deporting immigrants and showing support for migrants in a caravan of Central American asylum seekers. The rally held on a beach divided by the border wall was the second confrontation for Border Patrol agents since a caravan of more than 6,000 migrants, predominantly Hondurans, reached Tijuana last month. A confrontation with rock-throwers from Mexico led to U.S. agents firing tear gas into Mexico on November 25 and a five-hour closure of the nation's busiest border crossing. The group also is calling on Congress to defund Immigration and Customs Enforcement (ICE) and Border Protection.